Chill a bottle of your favorite vintage without condensation with this stainless steel, insulated bottle chiller. Simply place a bottle of chilled white wine, champagne, and more inside. The double-wall insulation prevents condensation on the chiller's exterior, keeping your serving linens and table dry. 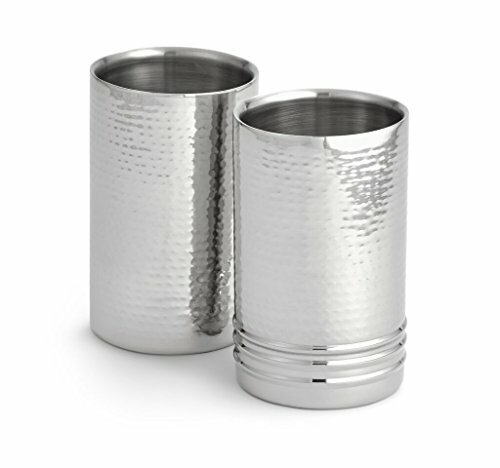 Crafted from heavy-duty stainless steel with an elegant hand-hammered exterior and brushed interior, this piece is an attractive and practical way to serve drinks at formal or informal events. Keep your wine cold at the table and avoid frequent trips to the refrigerator with this matched set. This pack includes two insulated bottle chillers. Each piece holds 1.8 quarts (1.69 liters), measuring 4.6 inches in diameter and 7.5 inches high. Hand wash with hot, soapy water and rinse thoroughly to clean. Dry immediately after washing. Avoid salt solutions or acidic foods and abrasive or harsh cleansers to preserve your piece's finish. Whether you are preparing small snacks, big meals and everything in between, great meals start with Artisan. Made from stainless steel, this wine chiller is perfect for keeping and serving cold drinks from a bottle. Chill a bottle of your favorite vintage without condensation with this stainless steel, insulated bottle chiller. Simply place a bottle of chilled white wine, champagne, and more inside. The double-wall insulation prevents condensation on the chiller's exterior, keeping your serving linens and table dry. Crafted from heavy-duty stainless steel with an elegant hand-hammered exterior and brushed interior, this piece is an attractive and practical way to serve drinks at formal or informal events. Keep your wine cold at the table and avoid frequent trips to the refrigerator with this matched set. This pack includes two insulated bottle chillers. Each piece holds 1.8 quarts (1.69 liters), measuring 4.6 inches in diameter and 7.5 inches high. Made from stainless steel, this wine chiller is perfect for keeping and serving cold drinks from a bottle. BarCooler Stainless Steel Wine Bottle Holder Double Wall Stainless Steel Cooler Keeps Your Wine Cold. Great Gift For Wine Lovers ! Fits Most Wine Bottles. Includes free E-Book + Gift Box. Wine Wand - the ultimate wine cooler, chiller, aerator accessory - 2 cooling / chilling wands, an aerator/pourer in each pack - wine can breathe , white, rose, red, champagne, cava, prosecco.